Think food processors are a hassle? Too much to deal with, to the point where it’s shoved awkwardly into the kitchen cabinet? I thought that too, until I saw these recipes that are so simple, and absolutely to die for! Turns out, food processors are a dream for sauces, truffles, ice cream, and more. Yes, you read that right: ice cream. Here are a handful of the very best food processor recipes out there. Check them out, dust off that food processor you’ve got stashed above the fridge, and get to mixing! Move over, store-bought breakfast bars! These bars take less than ten minutes to throw together, and are a godsend when you’re scrambling to make it out the door. Make them on a free afternoon, so you can just cut ’em up and go during the work week! Speaking of breakfasts, what about this smoothie? I know what you’re thinking: a smoothie in a food processor? You must be crazy! But my friends, I assure you, I’m not. There’s a cult-like aura around blenders, and it makes those of us who use a food processor feel uninvited to the smoothie party. But it turns out smoothies still turn out just as great in a food processor! Try this dream, which is just like a virgin piña colada that transports you right to the beach any time of year. And go ahead, nobody’s looking if you splash just a *hint* of rum in there. While we’re at the breakfast table, how about something to revive your morning toast? Minimalist Baker is the queen when it comes to things to spread on toast (or to just eat with a spoon). Like this coconut butter. If you’ve never had coconut butter, you NEED to try this! It’s a chunky, rich dream, that melts and softens perfectly onto a crispy piece of toast in the morning. Try it topped with a few slices of banana or strawberry, or just straight up for a decadent, filling, morning treat. Minimalist Baker is probably my favorite food blog ever. I mean, have you checked out this brownie batter spread? You read that right. A brownie spread. Just toast some nuts, mix five ingredients up in the food processor, and you have this dreamy brownie spread that she recommends on top of french toast. Excuse me while I fan myself. Enter these inner goddess truffles from Pinch of Yum. Wow. So simple, so decadent, so…healthy? Amazingly, yes! Packed with good fats and protein from cacao and nuts, these babies can be indulged in any time of day, worry free. I can’t seem to get enough of sweets straight from the food processor, and boy does this one deliver! If you ever crave ice cream – and who doesn’t – this gem is for you. A magic thing happens to frozen bananas when they’re tossed into a food processor: they become the smoothest ice cream – low sugar, clean, and divine. This blog offers four different variations of banana-based ice cream. Wow. Just look at that mint chocolate chip goodness! I know what my breakfast plan is gonna be..
Sweets are great, but what about the savory stuff? What about when it’s lunch time? Check out this great twist on a lunch classic: chickpea salad melts! This recipe delivers with that warm, gooey goodness of a melt, but has some quick, healthy ingredients that are most likely already in your pantry. Put that on some sourdough, top it with a little lettuce or cheese, and you’re good to go with a hearty sandwich that you can whip up in no time! How about a rich, chunky, arugula and cashew spread? Spread it on a panini, toast, crackers, or rice cakes. This dip takes only 15 minutes to make, and is an instant party – or lunchtime – hit. 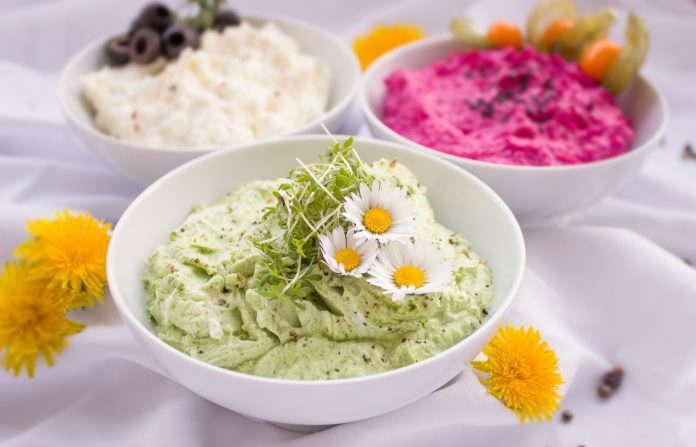 Food processors are made for dips and spreads. Minimalist Baker is at it again with her amazing baba ganoush. So creamy! So rich! This recipe calls for broiling the eggplant gives a deep flavor that’s crucial to making the best baba ganoush. I’m in heaven just thinking about it. No list of food processor gems would be complete without a solid hummus, and this one here does the trick. Smooth, rich, and “better than store-bought“, this one takes under 10 minutes to make, and you can immediately get to snackin’. Just don’t forget your carrots and chips for dipping! With football playoffs in full swing, and basketball ramping up, you really can’t have too many dips. Try this guacamole recipe for all your easy chip-dipping needs. While most guacamoles are hand-mashed – and not to knock the thick variety – this smooth, whipped guacamole is easy to dip, easy to spread, and easier to scoop than its chunky sibling. Whip this up in a few minutes – even during a commercial break – before enjoying the rest of a good game with your friends! Finally, I feel I would be amiss without introducing the world to this incredible “Rawcho” Cheese Dip. It’s creamy, amazing, and the perfect addition to all those dips we’ve been talking about. In my house, we whip this up, heat it, and drizzle it over nachos laden with jalapenos, refried beans, lettuce, and salsa. And I’ll come clean. Said nachos almost never make it to a plate all pretty – my family tends to eat them right off the pan! Whip this dip up, heat up some nacho fixins, and snack away! There are about a thousand other food processor recipes to share, but these are just a few of my faves. With recipes as simple as these, there’s no reason to avoid the food processor anymore! Dust it off, grab these simple ingredients, and start whipping these treats up! What are some of your favorite food processor recipes? I’d love to hear them in the comments below!